Phola Ayanda Gumede, known as @LoveslavePhola, is a Cape Town based DJ who describes herself as being a “product of cartoons and 90s music.” In an industry that is predominantly male, Gumede is paving a way for herself as a rising South African womxn DJ in the game, adding to the growing list of womxn making sure that representation isn’t just a word, but an act that creates more spaces of inclusion in the industry. 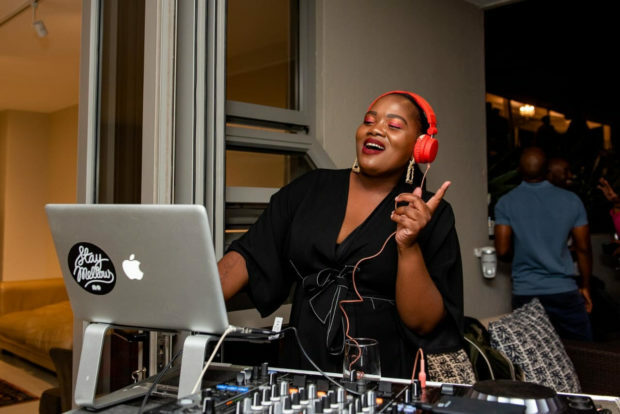 Her sets include everything from Aaliyah to Brenda to Trompies– it’s always a nostalgia-themed turn up when LoveSlavePhola is on the decks. Since February is ”the month of love”, we thought it apt to ask LoveSlavePhola, whose name says it all, to curate a special Spotify playlist that we’ll have on repeat for the whole month and beyond. But first, check out our interview with her. What made you get into deejaying? I got into DJing because I thought it would be a cool skill to learn and mostly because of my love for music. How would you describe your “genre”‘ or the music that is synonymous with a DJ Phola set? The genre of music my sets usually consists of is old school jawns, R&B, kwaito, and future beats. Do have any special considerations in mind when compiling playlists? Pretty much anyone can compile a playlist but it’s so much better if the playlist sets a certain mood or if it tells a certain story. What are the three albums you’ve been bumping lately? Barney Artist – Home Is Where The Art Is. Your style is also quite a big part of who you are; there’s no denying your effortlessly cool factor, how would you describe your style? I would describe my style as super comfortable yet fun.